East Coast corridor fly fishers have been described by bloggers “out west” as being smartly schooled in the old traditions of fly angling, but decades behind understanding the advantages of switch rods, spey rods, and of late, micro spey fly rods. They add, of course, lack of understanding a myriad of technical fly line developments – like OPST Commando Heads and Lazar running line. Visit any fly shop in Florida, Georgia, North Carolina, Virginia, New York, New England and maybe the Canadian Maritimes, and you will probably agree. Why? Because there are no switch rods, micro spey rods, shooting heads, tips or anything “spey” in those shop coordinates. And more than generally, no “reliable” knowledge regarding the latter. There are exceptions. To not bog down with a lengthy discussion of all that was aforementioned, let’s take a look at what seriously qualified folks know about micro spey rods – Winston and Redington, and the OPST’s Commando (shooting) Heads and their remarkable Lazar running line. Rotter said he had never thought of a short 12- to 15-feet long shooting head could be effective but admitted he was very wrong. Editors’ Note: I put an OPST shooting head (275 grain) and Lazar Line (90-feet) on my formerly retired Sage Bass rod… the original one, not Bass II. The little 7’ 11” work-horse morphed. It launched, as if nitroglycerin injected, a dumbfounding 90-feet with rod and line purchasing the distance on their own. I overshot the mark on my initial cast by about 40-feet. I coaxed a gathering of fly shop rats at my favorite stop in Georgia and had them all test drive my Sage / OPST “contraption.” Each, only capable of mounting a professional response: Holy s—t! The laugh a reaction to reaching unplanned distances with a minimal effort. Distance does not necessarily catch fish; often it’s a hindrance when trout fishing – think overline spook. What it does translate to is casting all day with minimal shoulder and wrist employment, and much-improved accuracy. Erik Carlson, a seasoned guide, and Red’s fly shop winter season sales aid, as well as, fixer of whatever needs fixing, had this to say about micro spey rods. We started our discussion on switch rods, which we agreed are not switch rods when they exceed 11-feet, or if a rod gets called a switch rod by a manufacturer and it’s over 11-feet, they are just short spey rods because they are a bear to overhand cast. Erik, what about these new micro spey rods – who buys them? Are there length issues like there are with switch rods? What is the fascination? 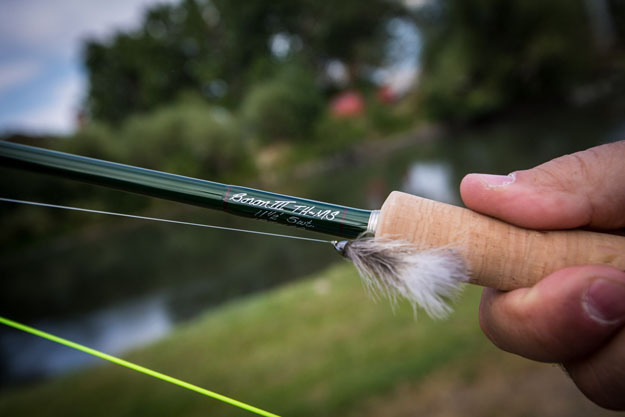 “The micro spey rod addressed those folks who want to spey cast for trout – small species. 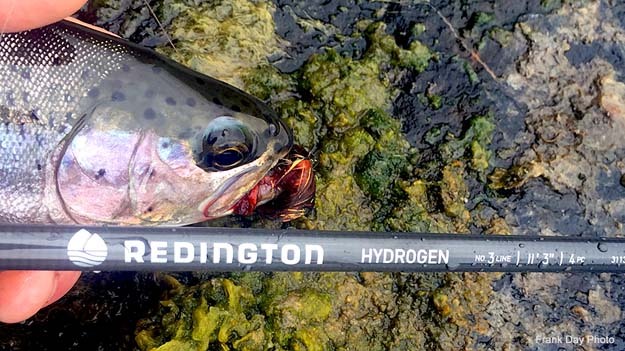 Almost all the rod makers that have met the rush to satisfy the explosion of interest in micro have limited their selection to 2-, 3-, 4-, and 5-weight rods. No one has decided length limits as a guide, but the best rods are switch length or slightly longer. A 14-foot 3-weight would, most think, cause huge management problems. Richard Farino, the owner of District Angling fly shop in DC, is well versed in the use of, as well as limits of long rods in East Coast waters. Richard is probably the most knowledgeable individual in the Mid-Atlantic East Coast about matters fly fishing… or at least, the most qualified to have an “industry” opinion. We asked him what he thought of micro spey rods and OPST Commando Head, and their Lazar running line: “The micros are great. Although we don’t have “spey” dedicated anglers here in the Washington DC area, these rods have gained in popularity because they lend to being cast and fished with easily. The 4-weights I’ve thrown were the most impressive (Winston and Redington), and when I open my shop, it’s that micro weight that I’ll be sure to carry. If someone catches a smallie (smallmouth bass) on the Potomac River using a micro, they’ll probably never go back to there 9-footer. It’s that much fun. Image courtesy of R. B.Meiser Fly Rods. A critique, if it can be called that, was a consensus also. The Winston Micro Spey 4-Weight does everything the 5-weight can do, but the three was too light. There is an advantage aside from pocketbook protection. The Redington four casts the same heavy munitions as Winston’s five. No, it does not cast as well, but the fish don’t know that. Their three can be used as a switch rod, and that is a real advantage. Don’t turn your nose up on Redington’s entries. Others shouted out in the micro category were Orvis’ Helios, R. B. Meiser Fly Rods, and Steve Rajeff’s ECHO. There are other micro-rods out there that will perform well so be sure to do your test drives. Winston Fly Rods . . .
Red’s Fly Shop . . .